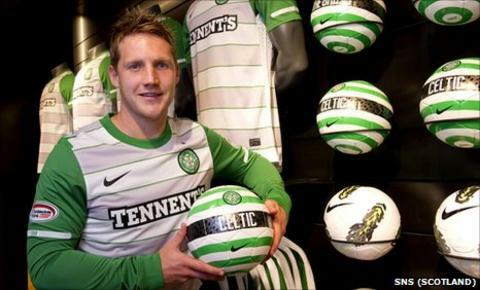 Celtic winger Kris Commons says establishing a European run is a priority for the club this season. Neil Lennon`s side were knocked out of two European competitions before the end of August last year. Commons is hoping for better when they enter the final qualifying round for the Europa League on 18 August. "If we perform on that stage it`s only going to make us better players and give us a huge amount of experience," he said. "A big draw for me signing was European football. Missing out on that last year was a bit saddening for me." The Scotland international who scored 14 goals in 21 games for Celtic last season, says he is not yet guaranteed first team football. "It`s important I establish myself in the starting XI, it`s something I`m still trying to do," he added. "I want to be one of the first names on the sheet and make sure the manager can rely on me each week to play to a high standard." Commons played in two cup finals and made a major impact in a title push that went to the final day of season. But he says their poor showing in Europe has been a talking point ahead of the re-start. "The manager has picked up on the fact we didn`t do half as well as we should have done in Europe," the 27-year-old said. "If we get off to a good start in the league, hopefully confidence will be high and we can try and get into the group stages." "The teams that he has been to watch across Europe, he feels we are not far from that bracket of perhaps even getting to the end of the knockout stages. "It`s going to be a learning curve but it`s something I have been wanting for a good eight, nine weeks and something I am relishing." Lennon was still in the process of assembling his squad when heavy away defeats at Braga and Utrecht saw Celtic suffer arguably their worst season in European football. "Many people have picked up on the results that didn`t quite go our way," Commons said. "We`re a young squad and we`re trying to get the mentality of crossing over the line. We didn`t do that, we blew far too many chances to get the SPL title. "But we are young, we are developing and I think this will certainly be a good year if we play to our potential."